When one seeks news from Haiti, it's easy to find bad news. And, while it's incredibly important to me to be informed on the unfortunate issues facing Haiti, I've felt that dreaded numbness creeping in lately. When all I read is horrible news, it's so easy for my soul to shut off. So, in addition to opening myself up to the horrors in Haiti that are still occurring today, I've realized I need to start seeking out some more positive and hopeful news from the place that so captures my attention. It's all about finding that elusive balance. 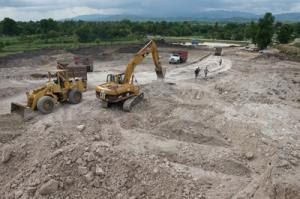 So here's some really awesome news I read from my favorite organization working in Haiti (besides Friends of the Orphans of course): Partners in Health just broke ground on a $15 million new teaching hospital in Haiti. It's good to see progress and it's even better to see it on this ambitious of a magnitude.